Luton Town have loaned young striker Zane Banton to National League side Boreham Wood for a month. 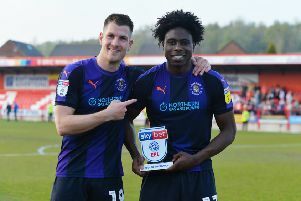 The 19-year-old, who signed professional forms at Kenilworth Road two years ago, making six appearances in that time, spent time at Biggleswade Town and Hemel Hempstead Town last season. The striker goes straight into the Wood squad to face Torquay United at Plainmoor on Tuesday night, with the Gulls beaten 7-3 on their home soil by Bromley at the weekend. Last year, Luton sent striker Lee Angol to the Meadow Park club as he finished top scorer, while Banton will join up with former Town trialist Mustafa Tiryaki who recently signed for Ian Allinson’s side.